We were fortunate enough to witness the brilliance of Chef Ryan Clift (of the famed Tippling Club) recently. 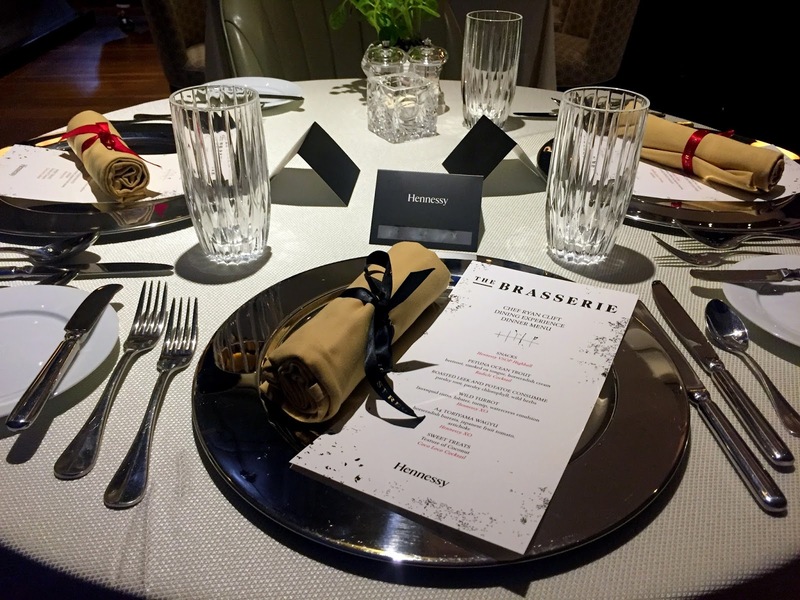 Chef Clift took over the St Regis' Brasserrie from the 26th to the 29th Oct for a 4 course lunch (RM338 or RM438 with Hennessy Cognac pairing), 6 course dinner (RM438 or RM538 with Hennessy Cognac pairing) and Sunday brunch (price starts at RM298 or RM468 with Hennessy Cognac). 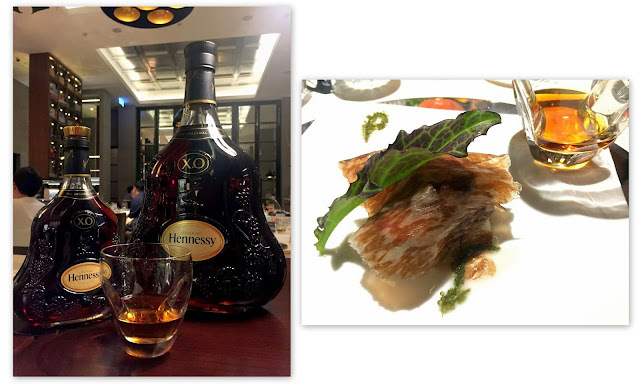 We were invited to sample a 5-course permutation of the menu thanks to Hennessy Malaysia. 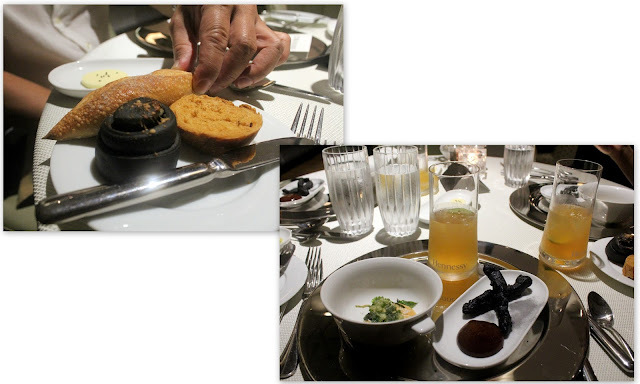 After an assortment of breads, the first course was a bowl of condensed tomyam mousse, served with a pair of char-grilled capsicums. Honestly, it's not a great looker but the capsicums tasted so damn good! This was paired with a refreshing Hennessy Highball (lime, lemon, passionfruit, syrup, soda and VSOP). The smell of vinegar permeated the air from the Petuna ocean trout with beetroot, smoked ox tongue and horseradish cream. The brilliant red "coral" from the beetroot was quite a sight and the dish was a taste explosion of contrasting sweet and sour flavours. This was paired with easy-going and sweet The Radicle cocktail made with muddled raspberries, syrup, lemon a bit of absinthe and the VSOP Hennessy. The Roasted Leek & Potato Consommé, with Parsley Root, Parsley Chlorophyll, and Wild Herbs was quite vegetal and looked too cute to be eaten, like it was a tiny little terrarium. It was surrounded by a creamy soup which was Clift's mother's recipe. A little taste of home and heartiness made wholly from white wine. 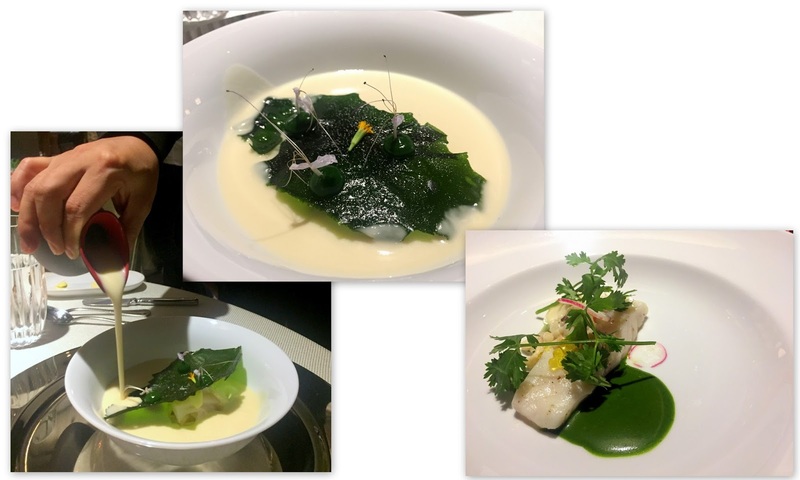 The Wild Turbot followed after, with faux squid risotto, lobster and turnip on watercress emulsion. Having them all with the Hennessy XO was swell. The A4 Toriyama wagyu (with horseradish burrata, Japanese fruit tomato and artichoke) was easily the highlight of the night. 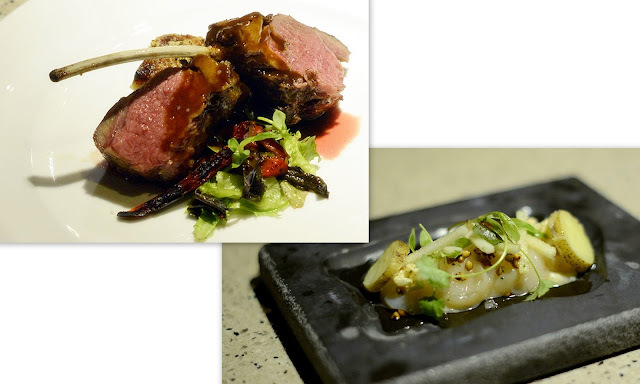 Served wrapped with wafer thin slices of home-cured wagyu beef, the umami-ness of the combination made my mouth water. Washed it all down with the XO, it was perfect. We had a taste and even the scent of outer space as a bonus. 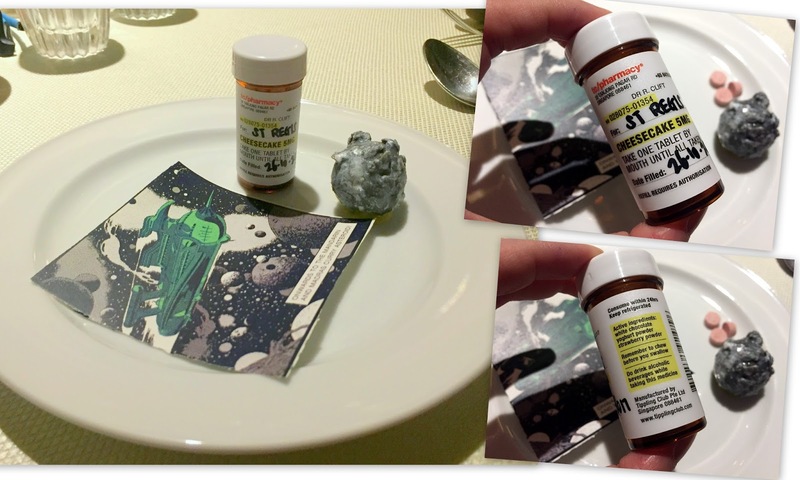 We had some cool-looking condensed cheesecake pills (delicious), mandarin and Madras curry sorbet space rock, and the smell of space on that comic card. Clift said that he was given the permission by NASA to access to an astronaut's used space suit to figure out the scent - which he had emulated on this card. This prelude to dessert was truly out of this world. 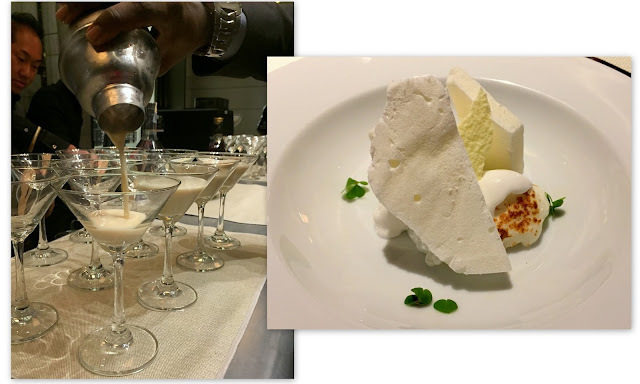 The actual dessert was Texture of Coconut - which was a coconut dish presented in different textures, accompanied by the Coco Loco cocktail which was a twist of a Brandy Alexander with the addition of yuzu sake. Much of what we’ve been fortunate to sample was nothing short creative. Thank you for this wonderful opportunity, Hennessy. You can't miss it. Babi is everywhere in Bali and so is bebek.. I really don’t know what our non porcine eating brethren eat in Bali because these are the must-do things to accomplish in this delectable tiny Island in the sun. .... Ah.. they probably eat a lot of ulam which makes sense as this fast growing touristic destination seem to be very big with vegan yogis. 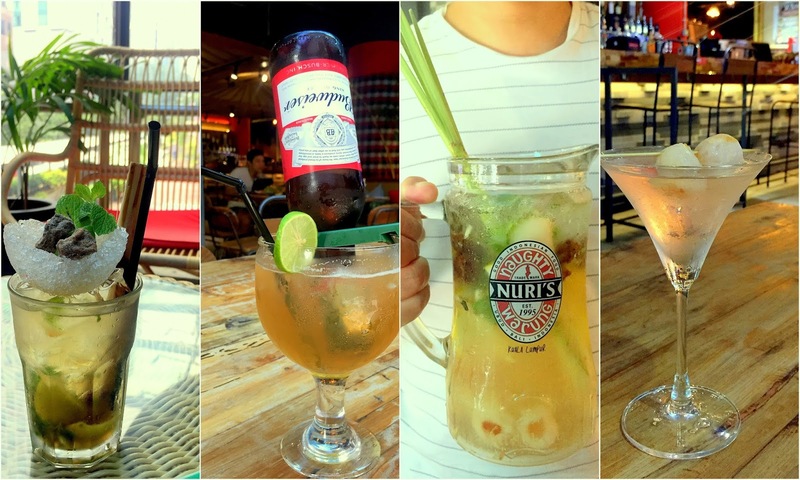 On a trip to Bali some months ago we had to make Naughty Nuri’s Ubud a must do stop. 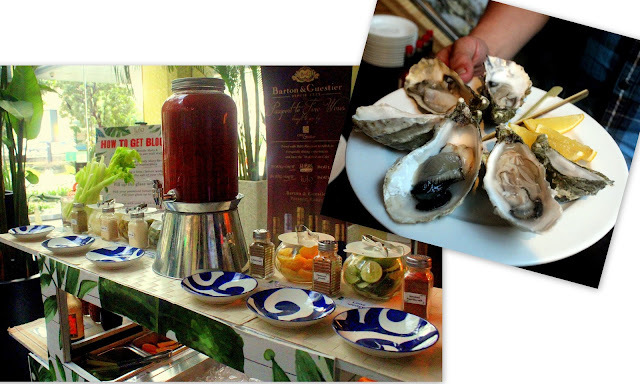 Lo and behold that we were somewhat surprised that it was a warong situated smack in parts unknown off Ubud central. 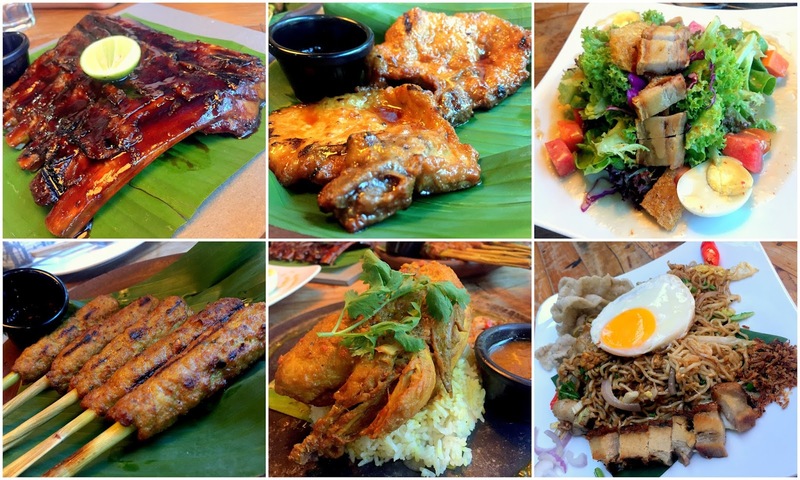 Naughty Nuri’s opened its first outlet in Malaysia a few years ago and now has sprung to a 6-outlet strong crowd favorite go to place for pork ribs. 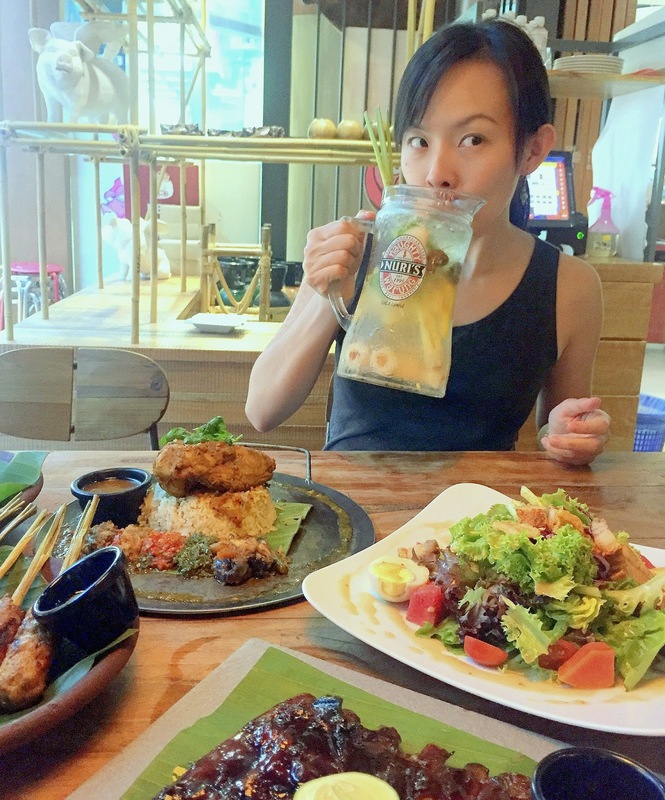 The signature rack ribs in Ubud did not disappoint and went superbly well with a bottle of cold beer. So forward a few months later and we had an opportunity to check out the outlet in Lifecentre, KL. You’d like to know that the menu in Malaysia is more extensive and varied than in Bali. 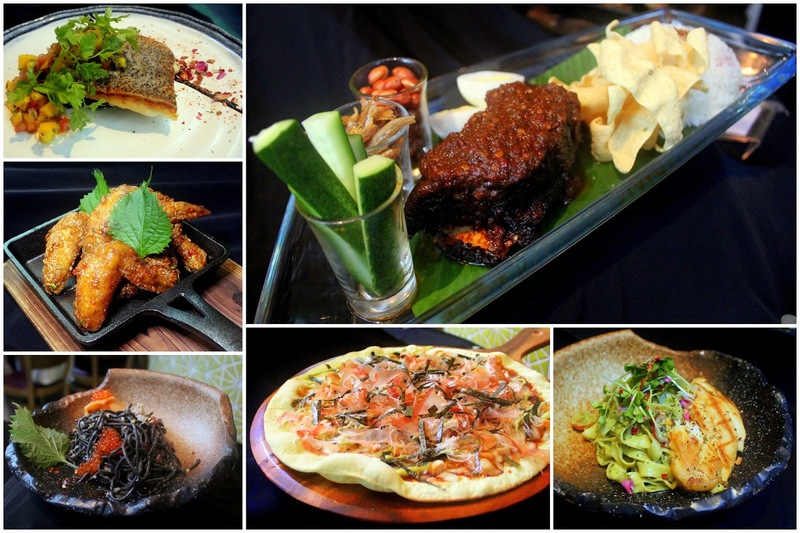 For one, we have here the balinese style bebek and a more extensive drinks menu to boot. Signature BBQ spare ribs (RM49) - on the sweeter side. You can see that the glaze from the Malaysian version is thicker than the Ubud version, which is drier. BBQ Pork chop (RM25) - also on the sweet side. We were told that the sweetness is a Balinese thing. Signature pork salad (RM28) - the opposite of healthy with a generous rack of siew yoke which is a good full meal for 2. BBQ satay lilit (RM26) - grilled pork paste and herbs on a lemongrass stick. Balinese Ayam Bertutu (RM35) - think chicken rice, but sweeter meat. Indonesian style mee goreng (RM25) - This came with siew yoke toppings... and one can never go wrong with siew yoke toppings. Pork was obviously the order of the day. Yum. 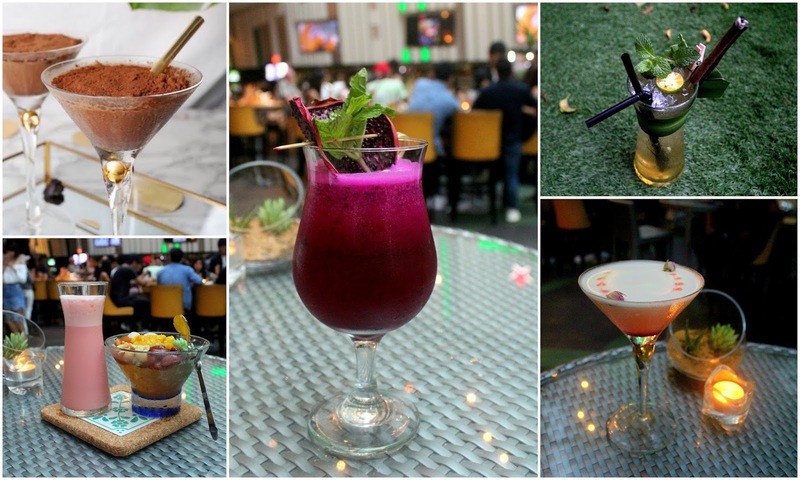 Of course, since they have an array of drinks on menu and this is a drink blog, we had to have drinks. Just 2 things to note if you do order any of its signature drinks. 1) Do specify if you prefer your beverages kurang manis (they are on the sweeter side). 2) If you do order a martini, the Naughty Nuri staff will shake (shaken, not stirred) it in front of you with a big song and dance. It is quite a sight and entertaining. They do have a selection of beers and spirits too if cocktails aren't your thing. You really can't have your babi without and ice cold something something. 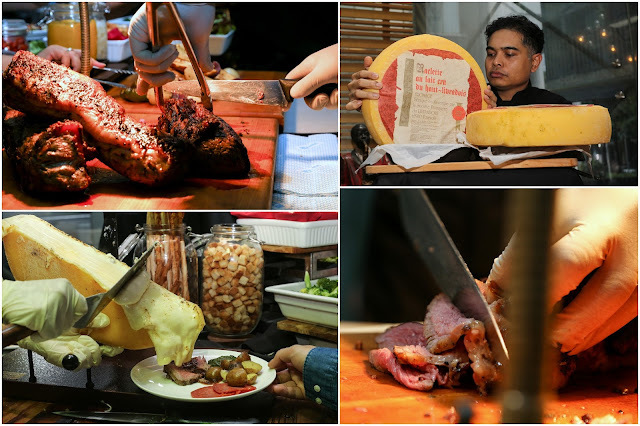 If you are up for an alternative buffet experience do give Naughty Nuris Sunday Snout to Tail buffet a try. It’s priced at 49.90++ and served between 11am-3pm and features most of the items mentioned and more. This deal is a steal. Look at this FA stuffing her face. Don’t say I bojio ah! 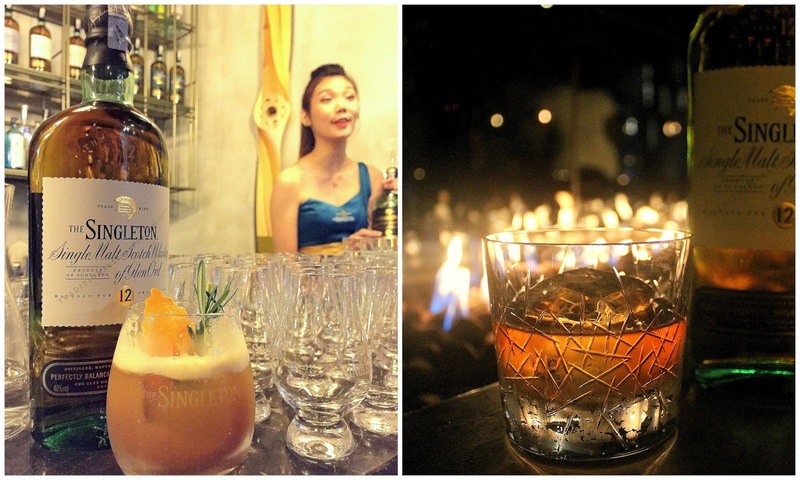 A group of us were whisked off to Genting's exclusive Ltitude to check out the launch of The Singleton's Forgotten Drop Series which is an annual release drawn from the brand’s rarest whiskies. Before the main event, we were plied with the loads of 12 year old (the legal sort, of course) straight or via the bar's own Glen Sour (Singleton 12, lemon juice, maraschino cherry, gula melaka, dark walnut bitters, orange peel oils and egg white) which was like having dessert before the mains (so naughty!). 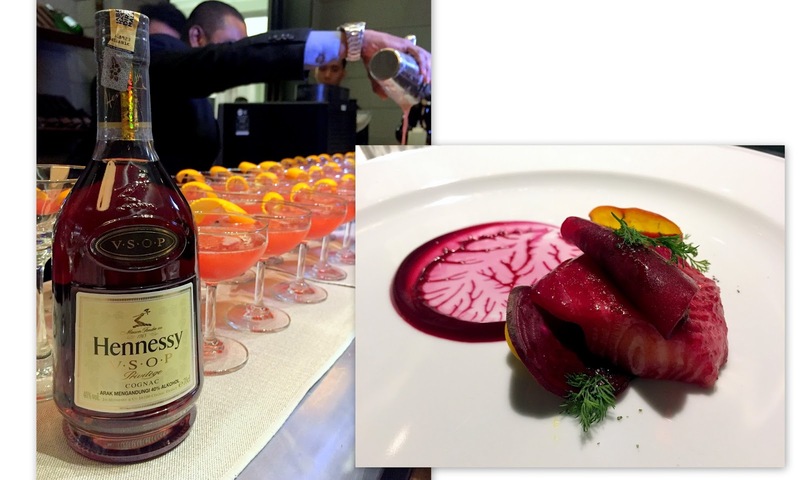 The 15 and 18 from the core range was also served. 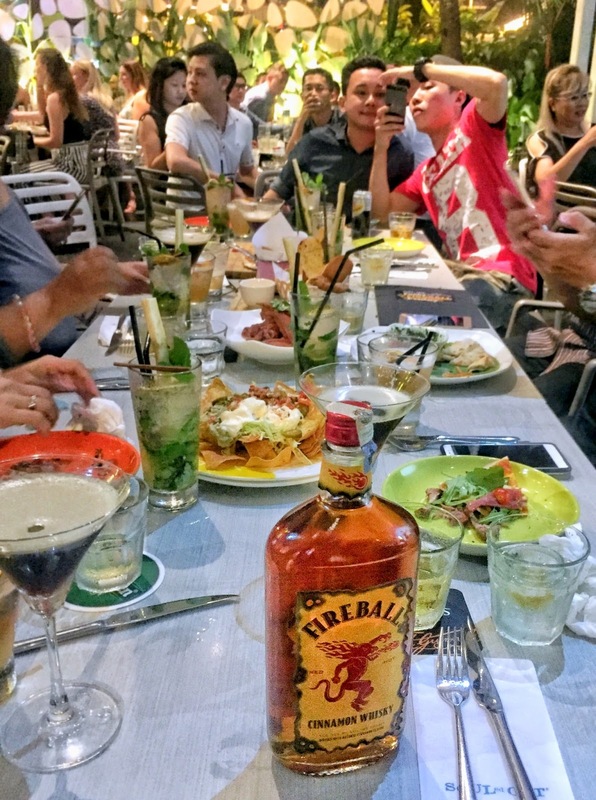 Of course, we can't drink on an empty stomach. We were fed with a full 4 course meal, curated by Steven Chou Yu Liang, the Chef De Cuisine at The Olive to pair with the whiskies. 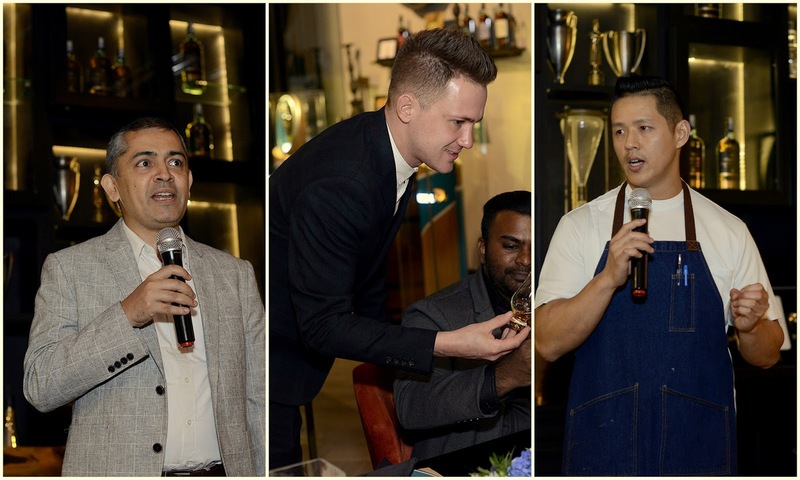 The supporting star of the night was the 18 Year Old Cask Strength, which is also newly launched in Malaysia to celebrate the distillery’s 180th anniversary. Bottled at 58.4% ABV it is only made available selectively with the starting price of RM 624.00. On the nose, I get coffee, some creme brulee, dark fruits, a hint of sulphur. With some water, the vanilla opens up. On the mouth, viscous, oily... It feels like it's evaporating from the moment it touches my tongue. 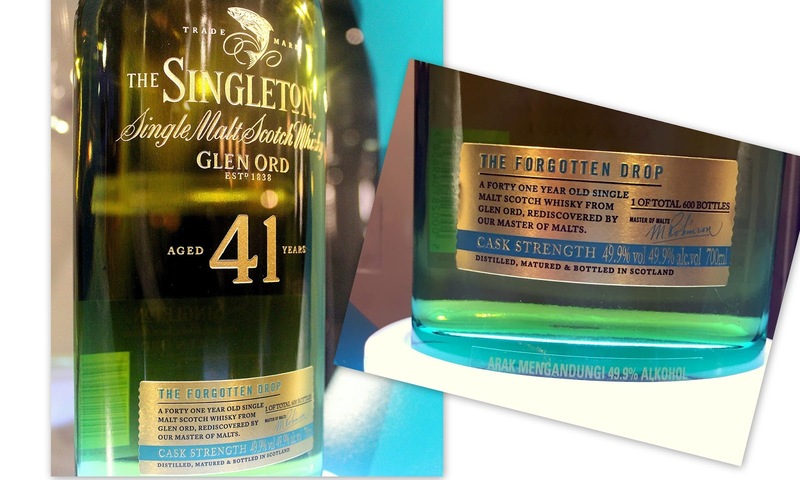 With our stomach lined, and appetite whetted, the star of the show was finally presented - The Singleton of Glen Ord 41 Year Old. 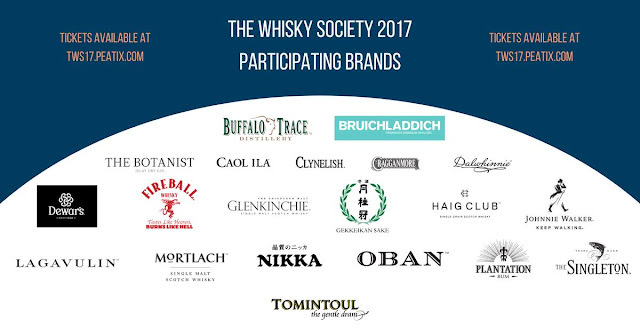 It's limited to 600 bottles worldwide and only 24 bottles in Malaysia. Bottled at 49.9% ABV, it retails at RM 15,193.00 per bottle. Matured in a refilled American oak (which is quite unusual for the Singleton), I get nangka fumes on the nose... some marzipan... fruit cake, perhaps? Contact diageoinfo@mhdm.com.my if you're interested in getting any one of these babies and if you get it, as usual, don't forget to jio! Thanks for the lovely time, guys! Slainte! So, by now, you would’ve heard that the Better Beer Fest 2017 is now canned (sorry, too soon?). Apparently the fate of the Klang Valley Octoberfest celebrations are also uncertain now. But, let's not get this put a damper our spirits (...sorry). 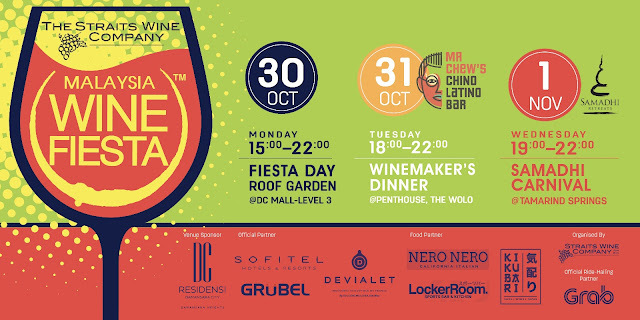 There is still a Wine Fiesta 2017!! The banner pretty much says it all - Malaysia's largest annual wine festival is back and features 70 wines from 29 wineries across 8 countries (from France, Italy, Portugal, England, USA, New Zealand, Australia and South Africa) for 3 days. RM98 nett for early birds until 30th September, RM108 nett and RM130 nett for walk-ins. Enjoy a specially curated food menu by Chef James, pair it with all the wines and chat with the winemakers. A collaboration with the Samadhi Group in conjunction with their 18th anniversary, it promises to fill you up with food, wine, music and a good time at Tamarind Springs. Plus stand a chance to win prizes when you hashtag #SamadhiCarnival2017 and #LSAxSamadhi in your event day photos. WIN TICKETS TO WINE FIESTA 2017! 3. Tag a friend on my page and comment why you think you should win. Contest ends at the end of the week - 16 October 2017 and other T&C apply (I'll make it as I go). Winners will be PM-ed for personal details – so make sure your Instagram/Facebook pages are accessible for me to PM you! I’ll see you there. Don’t say I #bojio!